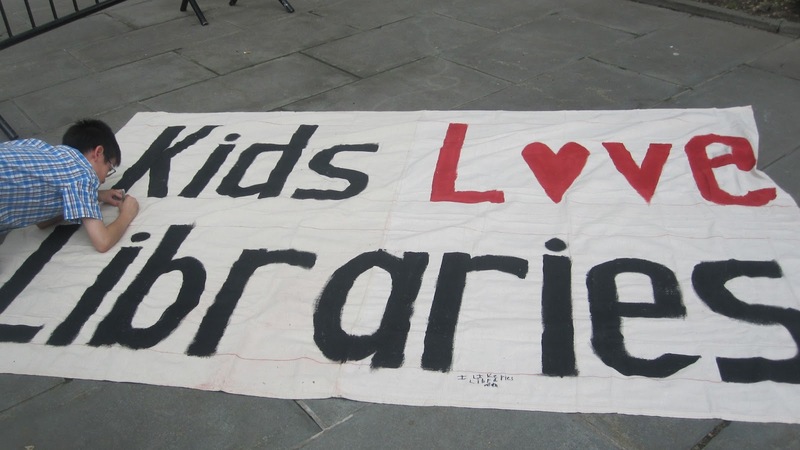 Last week I attended a rally for NYC libraries at City Hall as part of Urban Librarians Unite. I didn't get to take many photos because I was holding a sign (below) for most of the rally, but I wish I had been able to, because there was a great turnout, energetic speeches, and even some bubble-blowing at the end. It was definitely one of the more fun, productive-feeling rallies I've attended and it gave me hope about library funding going forward. School Library Journal covers it better than I could here and the Epoch Times covers it here - both articles are worth reading for their discussion the kid speeches (is there anything more hilariously adorable than an eight-year-old in a suit and tie?) and also because they talk about the introduction of legislation for baseline funding for libraries, which would be GREAT. If you missed that rally, there's still time for you to attend some today, May 28th! It's the City Wide Day of Rallies, and there's stuff going on in every borough. Check it out. If you can't go to any of those events, be sure to tune into this live feed (provided by the Queens Library Guild Local 1321) starting at 11am today. They are going to be broadcasting peoples' short (30 seconds or less) testimony about why they love their libraries. The other morning I had a really great class visit with a group of about 55 smart, funny third-graders. Their teacher had told me on the phone when we scheduled the visit that they were studying "A World Without Libraries" in school, which I thought was interesting, and a little strange. I didn't have time during our phone call to have her clarify what that meant, so I intended to get more information about it when they came to the library. The kids arrived a couple of weeks later, bright-eyed and excited to be at the library (or just excited about being temporarily outside of school) and sat down at the tables. I gave my usual welcoming spiel and tried to warm up the kids to talking about libraries. Me: "So, what city do we live in?" 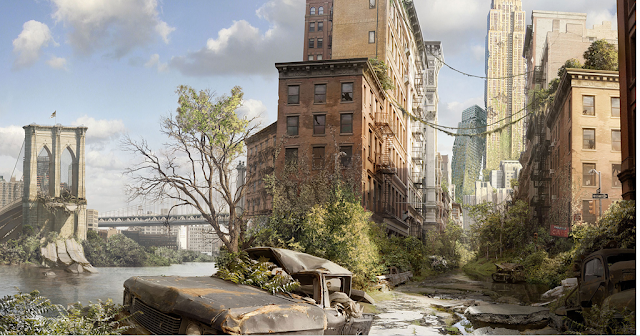 Me: "Yes, but more specifically, we live in the city of Brooklyn, right?" Kid: "No, Brooklyn is a BOROUGH!" We then chatted about their favorite books and library cards and databases and all the other great stuff kids can use at the library. When the conversation portion of the visit was winding down, I asked the kids to explain to me exactly why they were studying "A World Without Libraries" and what that kind of world would mean to them. "People would not be as smart." "I would stop reading as many books because I can't afford to buy them." "It would be bad for the economy. People would lose their jobs." "People in book stores would get rich." Anyway, the whole conversation left me feeling hopeful about the future of libraries, because if kids are the ones understanding that libraries have a necessary place in society, we just might not be doomed after all. In case you missed it, I recently wrote a response on the Book Riot site to a Huffington Post article by Michael Rosenblum. He basically asserts that libraries aren't needed anymore, everything on the internet is free and all information is Google-able, and other such fallacies, so I tried to refute him firmly and politely. (My piece "A Librarian's Response to 'What's a Library?'" also got picked up by the Huffington Post, so that was fun.) Check them out if you have time and let your blood boil. Truthfully, there are a lot more things I wish I could have written in my article, a lot more I could have said about the transformative power of libraries and everything they offer. But there's only so much time and space in which one has to write, so I'm at least glad that the conversation has started and that it is being continued eloquently by other librarians and library supporters. And with that, I am off from work until after Memorial Day. Be good to each other, my friends, and be good to your libraries! 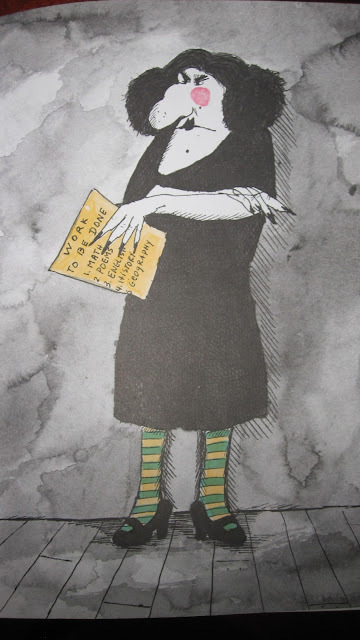 How are all my librarians doing? You feeling okay? Hanging in there? I just wanted to share a few library advocacy-related things with you. 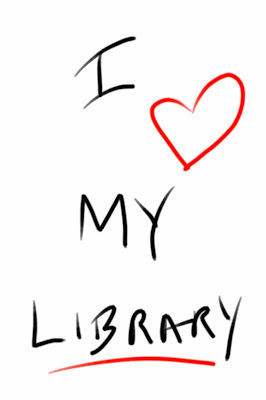 1) As a follow-up to a previous blog post, I wrote a Book Riot piece called Why Love Libraries? "Despite its budding beauty, longer hours of sunshine, and the promise of sweet, sweet outdoor drinking, Spring is a tough season for NYC librarians because every single year around this time, we face massive budget cuts that threaten to close our doors, cut our hours, lay off our staff, and kill our souls piece by piece. If you’d like more information, you can read the testimony of library heads from March about the proposed cuts here. 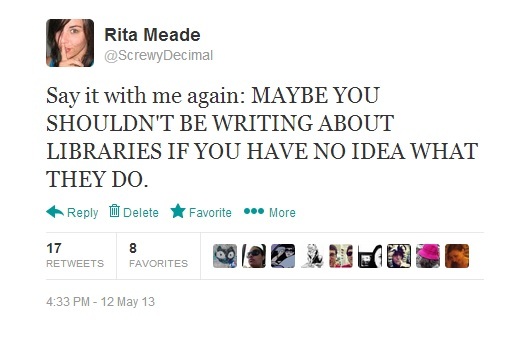 But Rita, you might be asking, doesn’t the mayor WANT to fully fund the city’s three library systems? Don’t millions of kids, teens, and adults use them each year? Aren’t library branches across the boroughs full to the brim every day, and don’t some residents demand even MORE open hours? In fact, isn’t there this whole new report on how libraries are more relevant and utilized in NYC with each passing year? Why yes, yes there is such a report! And you can read it here. Go ahead. I’ll wait. I can’t answer the question of why some of the “powers that be” feel that it’s right to cut libraries in a time when they are needed most. Perhaps it’s a political game of chicken. Perhaps there are other things at play behind the scenes that my tiny librarian brain can’t even comprehend. All I know is that as long as the cuts are on the table, we are going to fight them. 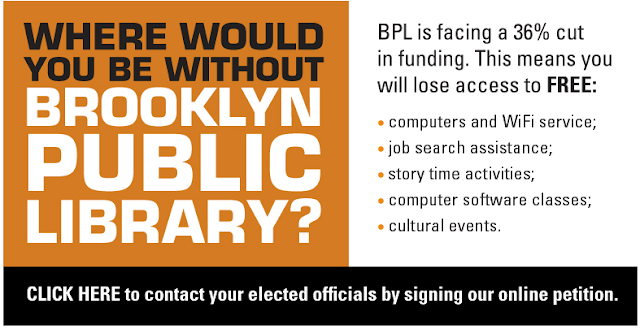 (And the library systems do have the support of many great Councilmembers, like Gentile and Van Bramer, just to name two – plus great advocacy groups like ULU.) So it’s not a battle that we’re fighting completely alone. But still, we must fight." I then shared some great responses I got from people around the internet about why THEY love libraries. Be sure to check 'em out. Thanks, internet people! 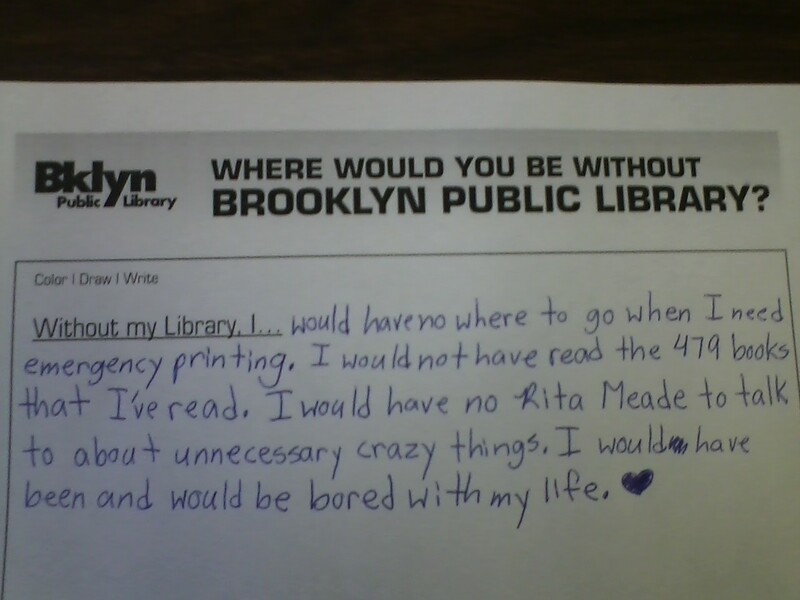 "It's hard to put words to what my local public library means to me. 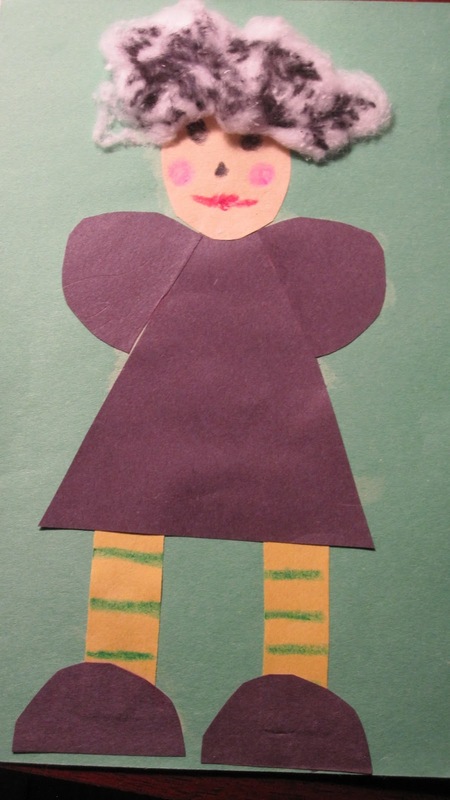 When I was a single teenage mom I made a weekly trip to the library with my daughter. While there I always felt a sense of comfort (I'm guess it was from being surrounded by order when my life was in chaos) and hope (walking out the door with a stack of books for each of us made us feel rich). The library is where I escaped to study to get my nursing degree. It instilled a love for reading in both of us which I believe impacted my daughter and her ability to become an environmental engineer. I truly believe my library shaped my life and the lives of my family for the better. Thank you for your work to save them!!" Absolutely lovely. Thank you, Victoria! 3) Brooklyn Public Library is doing a cool "Bike the Branches" fundraiser on Saturday, May 11th. If you are one of the brave ones who bikes in Brooklyn and you want to donate to the library at the same time, take a look and participate if you can. 4) Sort of related: my librarian band LOST IN THE STACKS will be playing a set at the Central branch from 12:00pm- 2:00pm on that day (May 11th), so if you're in the area, be sure to come by and say hello! 5) Lastly, you should read this great pro-library manifesto in the Huffington Post written by my friend and fellow-ULU-er Christian Z. 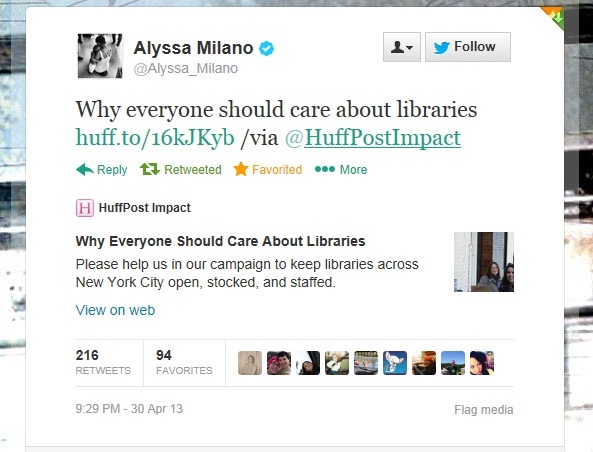 Most of the comments are very heartening and even Alyssa Milano was moved to spread the word. Keep up the good advocacy work, everyone!